There’s an old saying in real estate that says if your home is priced over the market then it’s not really on the market. Essentially an overpriced listing is invisible to the buyer because it’s attracting the wrong prospects. These are called invisible listings. The correct prospects never see it on their radar because they search up to a certain point and cutoff anything over that. The prospect that can afford the overpriced home is looking at other homes as well, and they quickly see other homes offer more value. Perhaps it’s more size, better location, better condition, more amenities, etc. Overpriced listings miss the market both ways, and therefore they linger on the market. Periodically we publish the local market’s month supply of inventory by price range. We decided to take the monthly supply of homes in each category and consider how many homes are currently on the market in that category that exceeds the average monthly supply. When a home doesn’t sell it’s either overpriced or not marketed correctly. Many times, it’s both. If you have a home worth more than $ 1 Million we know there is a 22.58-month supply of homes on the market. When you list a home you should ask yourself, when would I like to move? If the answer is less than 22 months, you’d better price it and market it effectively. The good news is only 8.3% of the homes over $ 1 Million are invisible. 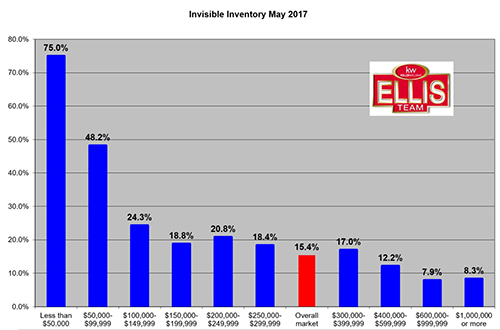 The overall Lee County single family home market is 15.4% invisible. This tells us that 15.4% of the home sellers have overpriced their homes such that they’re probably not going to sell unless the owner takes action. They will expire. Putting your home on the market is not a fun experience. You have strangers coming through your home when they want and you must keep the home in show condition all the time. Nobody would want to go through that experience unless they were serious about selling. And yet, some are not serious because they overprice their home and it’s invisible. When you list your home you not only want it visible, you want it to stand out. Therefore marketing and pricing is critical. The seller controls the price. The market determines the value. Not all Realtors market the same. Some market very little while others do much more, and a select few market a lot. Some Realtors don’t believe marketing sells homes and only price sells homes. That’s simply not true. If you were in the market for a new car I can guarantee you there are a few dealerships you’ve heard of. Why? Because they market and it works. If you could buy a new car and get a TV or a cruise would you take it? Only if you knew about it. If you liked that brand and the value was there, you’d at least consider it, because their marketing works. The same is true in real estate. It’s not enough to have the lowest price and pray that’s enough to sell your home. The world needs to know about it, and listing it in MLS isn’t enough. Sure, listing in MLS can get your home on some websites, but it’s not promoting your home. This is where Realtors who understand marketing stand out. Besides, not every seller wants to give their home away just to sell it. We believe you should receive fair market value. To get that, you need marketing. To expect more than fair market value insures it will not sell. If we listed a home worth $300k and marketed it at $600k no amount of money spent on marketing would sell it. To get full market value requires correct pricing and full-blown marketing. If you have a home to sell, you should call the Ellis Team at Keller Williams. 239-489-4042 We’ll help you get Top Dollar and make your home visible, and stand out. You can also visit our website www.LeeCountyOnline.com and search for homes. We look forward to meeting you! Posted in Cape Coral, Cape Coral Real Estate, Fort Myers, Fort Myers Beach, Fort Myers Real Estate, Open House, Southwest Florida Real Estate.Tagged Invisible Listings, Southwest Florida real estate market.